Making homemade almond flour is so easy and a fraction of the price that you would pay at the store for it. You might have noticed almond flour popping up in recipes all over the internet. This is for a few reasons. First, almonds are just packed with vitamins, protein and healthy fats. Almond flour is often used in gluten free, paleo and raw food recipes. It is very versatile and can be used from everything from pie crust, to muffins to a tasty coating on chicken or fish. Buy a bag of whole almonds. Blanched or raw doesn’t matter. I find the raw almonds turn into more of a whole wheat colour and consistency because they still have the skin on while the blanches turn out more like a white flour. To make 1 cup of almond flour, put about 1.25 cups of whole almonds into your food processor, blender, magic bullet or whatever grinding device you have and pulse until there is nothing left but small crumbles. Be careful not to overblend because then you will make almond butter. If this happens, put it in a jar and spread some on some celery while you reset to try again. It is a delicious recipe botch. Store any extras in a jar in the fridge. 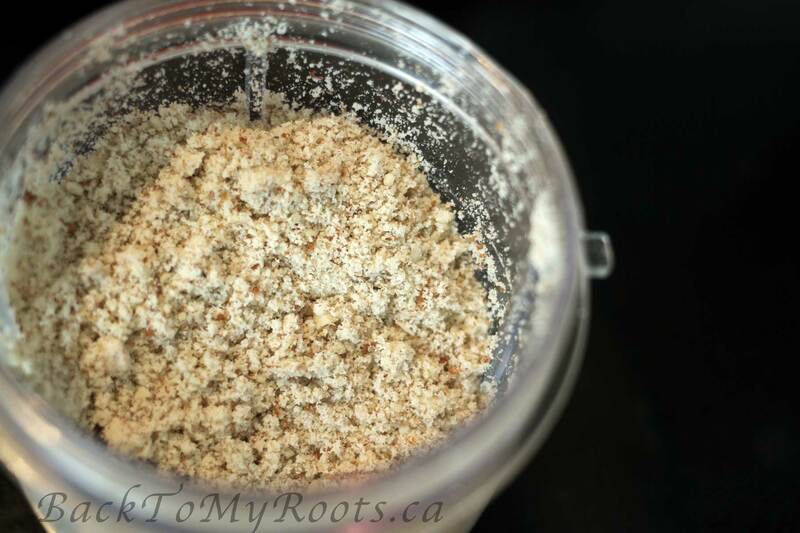 The ground almond flour should be used fairly quickly as it will spoil. That being said I have had some in my fridge for 5 weeks now and it is still in great condition to be used if not as fresh as it used to be. You can also make homemade almond milk very easily and use the pulp to create a more mild-tasting almond flour. I will be publishing a new post soon to show you how it’s done. This way you get milk AND flour out of one batch of almonds. The frugal part of me is patting myself on the back. Note – I have been known to toast my almonds (and let cool) before blending if I want a stronger nuttier taste. I will do this if I am coating chicken or fish because I love the extra nuttiness it gives the recipe. Great Homemade Almond Flour. Thanks so much for sharing your awesome recipe with Full Plate Thursday. Hope you are having a great week and come back soon!